Jim Rogers started trading the stock market with $600 in 1968.In 1973 he formed the Quantum Fund with the legendary investor George Soros before retiring, a multi millionaire at the age of 37. Rogers and Soros helped steer the fund to a miraculous 4,200% return over the 10 year span of the fund while the S&P 500 returned just 47%. “You (foreigners) cannot transfer shares from one broker to another. I just don’t like investing in South Korea because the stock exchange is so absurd,” Rogers told The Korea News Plus in a recent telephone interview. Jim Rogers "the 19th century was the century of the UK , the 20th century was the century of the US , the 21 st century is going to be the century of China "
JIM ROGERS - 19 Feb 2018 - Money Will Be On The Internet, Has Gold Bottomed? Jim Rogers WARNING OCTOBER 2017 - 3 Ways to Prepare for the Upcoming Crash! Who is Jim Rogers ? Jim Rogers started trading the stock market with $600 in 1968.In 1973 he formed the Quantum Fund with the legendry investor George Soros before retiring, a multi millionaire at the age of 37. Mr. Jim Rogers is Independent Director at Xylem, Inc., a Member-American Section at Société de Chimie Industrielle, a Member-Executive Committee at Sequoyah Corp., a Member at The Business Roundtable, and a Member-Executive Committee Sequoyah Council at Boy Scouts of America. He is on the Board of Directors at Xylem, Inc. and LORD Corp.
Mr. Rogers was previously employed as a Member by American Chemistry Council, Inc., President by United Way of Greater Kingsport, Executive Chairman by Eastman Chemical Co., Chairman & Chief Executive Officer by Eastman Ventures, Chief Financial Officer & Executive Vice President by Building Materials Corp. of America, Chief Financial Officer & Executive Vice President by GAF Corp., Executive Vice President-Finance by International Specialty Products, Inc., Treasurer by Amphenol Corp., Vice President-Finance by Morgan Guaranty Trust Company of New York, and Naval Aviator by United States Navy. He also served on the board at Genencor International, Inc. He received his undergraduate degree from the University of Virginia and an MBA from The Wharton School of the University of Pennsylvania. 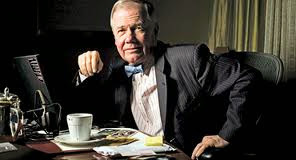 Jim Rogers News Blog is fan-published. It is not authorized, endorsed, licensed, approved, recommended, published, maintained, edited or managed by James B. Rogers, Jr. or any of his affiliates, agents or representatives (all such persons are referred to as "Jim Rogers" in this disclaimer). JIM ROGERS ACCEPTS NO RESPONSIBILITY OR LIABILITY WHATSOEVER FOR THIS CHANNEL OR ITS CONTENT, INCLUDING ITS ADVERTISEMENTS AND LINKS TO OTHERS' WEBSITES. NO ENDORSEMENT OR APPROVAL BY JIM ROGERS OF ANY INDIVIDUALS, GOODS OR SERVICES IS IMPLIED. TEXT, VIDEO AND OTHER CONTENT AVAILABLE ON OR VIA THIS CHANNEL MIGHT MISQUOTE, MISCHARACTERIZE, USE OUT OF CONTEXT, EDIT OR OTHERWISE MISREPRESENT JIM ROGERS' STATEMENTS AND VIEWS. USE AT YOUR OWN RISK. This blog is not intended to give you financial advice. Before investing, do your own research and consult your financial adviser.